MOST PEOPLE associate the strict amateur code with clubs like Corinthian and Casuals, but there were a host of other clubs who lived by the ideals and philosophies that gave birth to leagues like the Isthmian, Athenian and Spartan Leagues. One such club provided a haven for Scots based in the south of England – the London Caledonians. The club dated back to 1886 and given Scotland’s early impact on professional football, as witnessed at Preston North End- a team built around Scots, it is no surprise that they were influential in amateur circles. 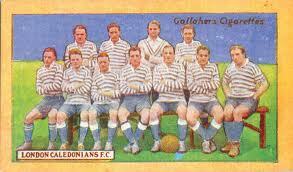 London Caledonians were renowned for playing “pretty” football – they were the precise words of a Victorian programme. They were also good travellers, becoming one of the first clubs to play abroad when they visited Paris to play Le Club Francais – French champions in 1895-06 – in 1898. They undertook a series of tours to continental Europe in the years that followed, including Holland and Belgium. Among the talented players to turn out for Caley in those days was Thomas Fitchie, who played – as an amateur – for Woolwich Arsenal, Fulham and Tottenham. Fitchie was to win four caps for Scotland while with Arsenal and Queens Park. Caley, as they were known, exploited passing football to outplay their opponents. When the club became one of the first to be admitted to the newly-formed Isthmian League in 1905, they won the competition at the first attempt. They won seven of their 10 fixtures, finishing ahead of fellow Londoners Clapton. They won the league despite losing their star player, Willie Porter, to Chelsea during the campaign. The following season, London Caledonians visited Stamford Bridge as part of the deal and beat the Pensioners 1-0, such was the strength of their side. Some of the leading amateur players of the age were eager to put on the club’s distinctive hooped jersey. Goalkeeper R.G. Brebner, who played in both the 1908 and 1912 Olympics for Great Britain, appeared briefly for them, while also playing for Huddersfield Town, Chelsea and the Northern Nomads, another amateur institution. 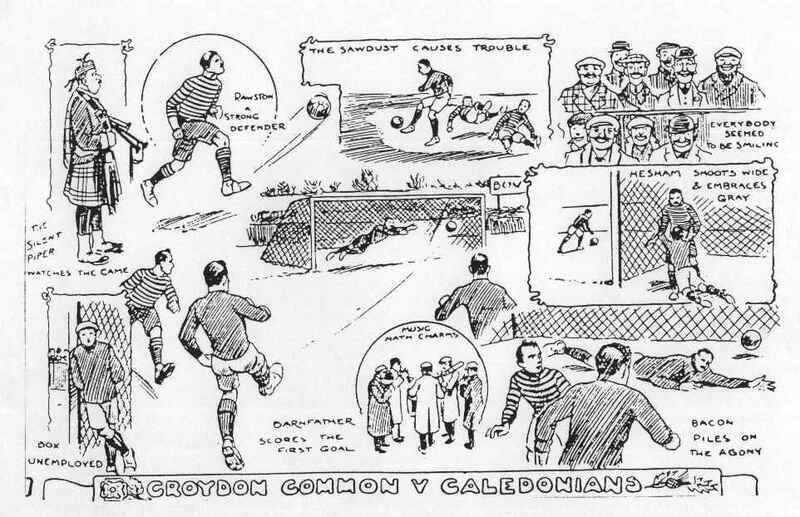 London Caledonians didn’t retain their title in 1906-07, but a year later, they topped the table once more, edging out Clapton by a single point. But between 1911-12 and 1913-14, they won the title three times in a row, losing just five games in that period. One fixture in May 1912 deserves special mention, however – Caley meeting the rest of the league in a benefit game for the Titanic Fund. The club closed down during the first world war, but when football resumed, they were back in the Isthmian League. In 1923, the club achieved national eminence when it won the FA Amateur Cup. They reached the final by beating Slough (10-2), R.A.M.C of Aldershot, Summerstown and Ilford, before meeting St.Albans at Luton in the semi-final. An own goal and a strike by inside left May were enough to beat the Saints 2-0. Their opponents in the final, played at Crystal Palace, were Evesham Town. Irish international Andy Sloan opened the scoring for Caley after 13 minutes. Belfast-born Sloan won one full cap and a handful of amateur caps for Ireland. He was a player who could light up a match with his pace and determination. He was also a prolific goalscorer for Caley. Evesham levelled just before half-time, but in the 77th minute, Jack McCubbin scored the winner to take the cup back to Tufnell Park. The Amateur Cup winning side also included the Gates brothers, Basil and Eric, the former who represented Great Britain in the Olympics in 1920. Caley went very close to reaching the final again, reaching the semi-finals in 1923-24 but lost after three games to Erith & Belvedere. A year later, they won the last of their Isthmian titles. The club went into something of a decline just before the second world war and didn’t return when hostilities ceased. Their time, like both the Casuals and Corinthian, had passed. But they left behind some great memories of an age when playing the game for game’s sake was certainly more relevant than it is today.